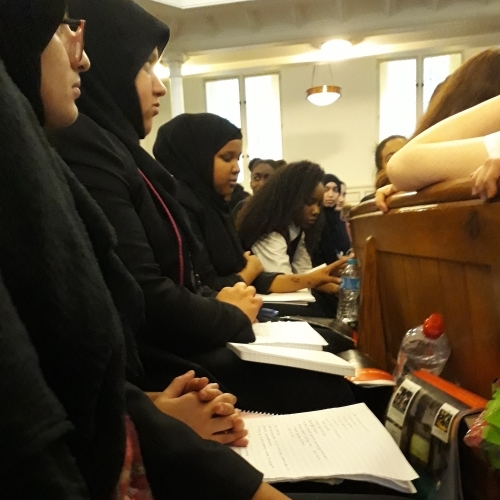 25 Year 11 students were selected to attend a Religious Studies conference in central London’s Bloomsbury Baptist Church with the distinguished Dr Peter Varady. The day consisted of three sections- one on peace and conflict, one on sanctity of life and quality of life and one on the role of Jesus. Students were offered techniques to help them achieve the highest marks in the subject but also to deepen their thinking and challenge stereotypes. Students also took part in debates on whether “The quality of life matters more than the sanctity of life” and “Religious people should be committed to pacifism.” Jessica Blankson-Hemans, Aya Boucheneb and Ayat Mohamed all openly argued their viewpoints with other school from across wider London, holding their own amongst a very elite crowd. Ms Hosp was a very proud head of department after a long day of revision and re-thinking!